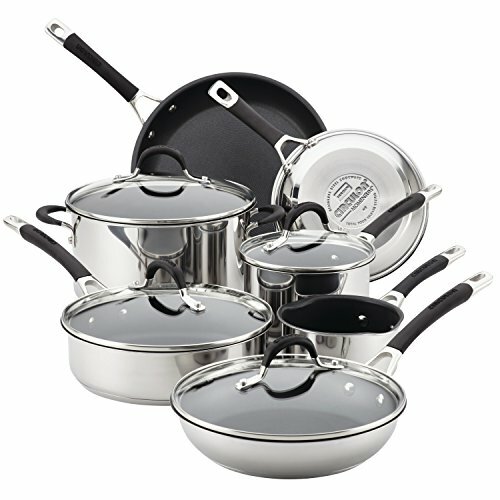 Empower the kitchen for cooking and cleaning efficiency with a gleam of stovetop style, using the all-range, dishwasher-safe Circulon Momentum Stainless Steel Nonstick 11-Piece Cookware Set. Circulon Momentum cookware is engineered with superior nonstick technology and time- and energy-saving convenience. In the cookware base, an aluminum core fully encapsulated with magnetic stainless steel delivers exceptional heating and cooking. And this cookware is suitable for all cooktops, including induction. Whatever your cooking task, need or intention, from basics like a quick weekday breakfast or special meals like dinner with friends, every skillet, pot and pan delivers dependably and then some. Best of all, the cookware is dishwasher safe for the ultimate in convenient cleanup. Circulon cookware features the unique, PFOA-free TOTAL Nonstick System with premium metal-utensil-safe nonstick on raised circles, so foods release and cookware interiors clean with ease. From the small saucepan up to the stockpot, each piece sports this innovative nonstick surface, promoting long-lasting resistance to surface scratches, stains, and chips. Finishing details include silicone-enhanced stainless steel handles double-riveted for comfortable, confident handhold and shatter-resistant glass lids on the covered pieces. Oven safe to 400 DegreeF, Circulon Momentum Stainless Steel Nonstick cookware is backed by a Hassle-Free Lifetime Guarantee. Shift into the next level of kitchen convenience while enjoying delicious and healthy cooking, with the versatile and proficient dishwasher-safe Circulon Momentum Stainless Steel Nonstick 11-Piece Cookware Set.